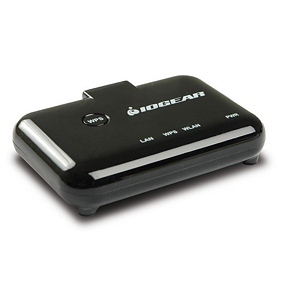 This wireless-N (IEEE 802.11n) adapter works with any one device with an Ethernet port... Just connect the adapter to your device with the included patch cable and you won't have to worry about re-wiring your home. Connect your Blu-ray Disc(R) player, HDTV, PlayStation(R), Xbox(R) or other Ethernet-enabled device to any 802.11b/g/n network in your home or office. You can use WPS for one-button setup if your router supports it, but setup instructions are included for Microsoft Windows and Mac OS. Includes patch cable, AC adapter and hook and loop fastener. Requires Ethernet-enabled device and existing 802.11b/g/n wireless network.